a photo on my hot pink chair. 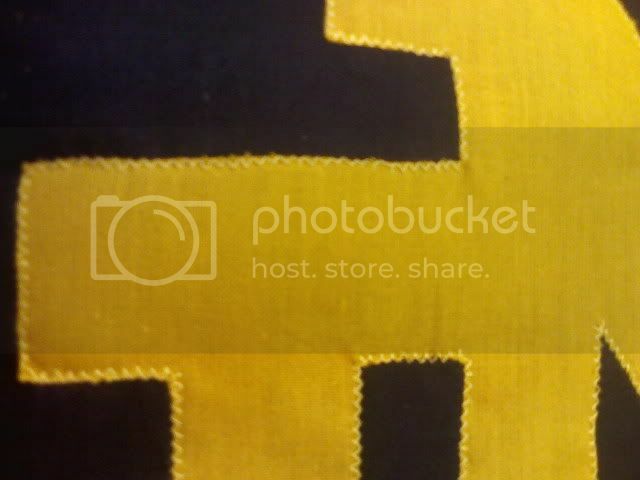 and I tried to take a close-up of the stitching. It's just plain old cotton with a zig-zag stitch, so it will probably start to fray right away, but I don't think he will mind too much. Well, I hope he likes it! no comments? Well I gave it to him today and he loved it. Also, turns out he did get me a present-- he baked me cookies. I didn't really mention that I made it, so I don't know if it's obvious or not... it'll probably come up at some point later, but I feel like I should have mentioned it at least. anyone else ever wonder whether or not they should say if something's home-made? That's a very nice present! You've given me a great idea for my mom's birthday. She's a huge University of Oregon fan and something like this would be perfect for her "Duck Room"
I'm never sure about pressing the homemade issue. Unfortunately with most of my presents, it's quite obvious that they're homemade. it looks so nice! 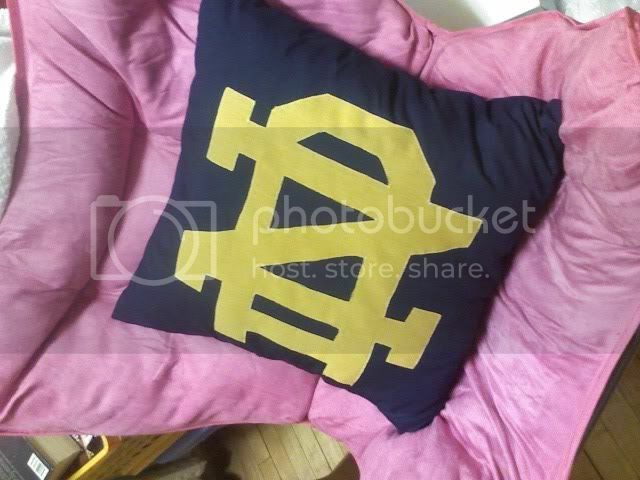 my boyfriend would flip if i made one of these for him.. he's a huge notre dame fan! did you hand sew the ND on or machine sew? I machine stitched it, but there were a couple places where I screwed up a little but I didn't bother to fix them until after I sewed it together and stuffed it. So I had to repair the errors by hand. This totally rocks! My co-worker has been bugging me to make him a Notre Dame banner. Mebbe I can get away with a pillow instead, eh? My brother is a huge ND fan. Did you do the logo yourself or can you purchase it somewhere? I would love to be able to make something like this for him too. What a great gift idea!! I'd casually tell your friend that you made this pillow because he might want to buy one for someone else at the bookstore. Its so nicley done! Let him know you made it! you crafty diva you! Yeah... my dad is a huge fan... I might just have to do something like that for him. And you should definitely tell him. It's not about pressing the issue, it's about showing you care. Hey, he baked you cookies didn't he? That's homemade. It seems like it would be a little awkward now, but just bring up the issue something like, "Is the notredame pillow holding up alright? I've never made anything like it before so I wasn't sure if it would fray or not." Idk. You did an amazing job on it though.